The Univision network's top executive released a staunch defense of Jorge Ramos on Wednesday night, 24 hours after the anchorman tangled with Donald Trump at a nationally televised press conference. Randy Falco, the CEO of Univision, said Trump's treatment of Ramos "demonstrated complete disregard for him and for the countless Hispanics whom Jorge seeks to represent through press questions that are at the heart of the First Amendment." On Tuesday night, Trump's campaign briefly ejected Ramos from a press conference after the anchorman stood up and tried to question Trump about immigration. Falco said "the recent treatment that Jorge Ramos received at Mr. Trump's press conference in Iowa is beneath contempt." Ramos, who is both a nightly news anchor and an advocate for Hispanic Americans, had a lengthy debate with Trump once he was allowed back inside. The two men jabbed at each other on Wednesday, with Trump calling Ramos a "madman" and Ramos insisting that Trump must be called out for fostering hatred and division. Some prominent commentators criticized Ramos for speaking at the press conference without being called on and for crusading against Trump's deportation plans. On the other hand, Ramos' fans say they admire his point-of-view journalism. Falco is clearly a fan, and Wednesday's statement was designed to reaffirm his support for Ramos, the network's best-known news anchor. "As a Presidential candidate, Mr. Trump is going to get tough questions from the press and has to answer them," Falco said. "Jorge Ramos is one the most professional, dedicated and respected journalists I have seen or worked with in my 40 years in media. He always asks hard questions of candidates and elected officials, regardless of party or issue." Falco's comment, "regardless of party or issue," was an implicit rebuttal to those who have described Ramos as a left-wing activist, as Fox News host Bill O'Reilly did on Wednesday night. Falco's statement concluded, "I remain grateful for the first-rate journalistic work that Jorge and all of his news colleagues at Univision and Fusion do to bring all points of view to the 57 million Hispanics in this country." Fusion is an English-language cable channel co-owned by Univision and Disney (DIS). Univision is by far the most-watched Spanish-language broadcaster in the United States. Ramos is the face of the network's news coverage. He has been described as the "Anderson Cooper of Spanish-language news" and even the "Hispanic Walter Cronkite." Ramos said he'd been pursuing a Trump interview for months and decided to attend the Tuesday press conference in Iowa because he'd been repeatedly turned down. 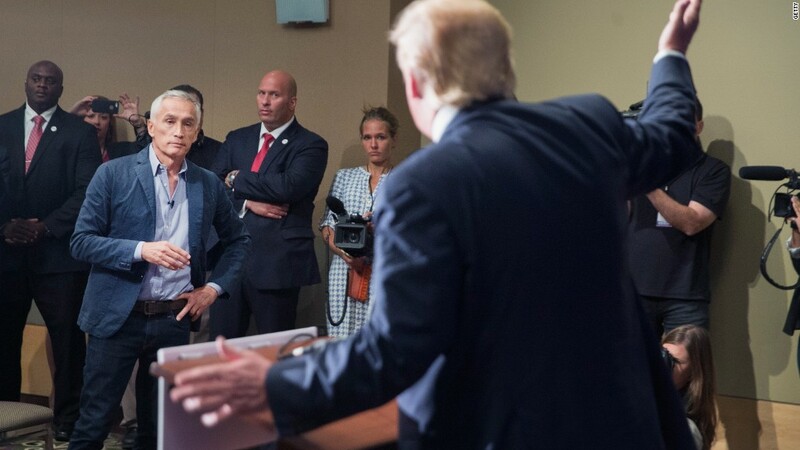 During the testy exchange, Trump reminded Ramos that he is suing Univision for $500 million. The suit stems from the channel's decision to cancel its airing of the Miss USA pageant in July. Univision dropped the pageant to protest Trump's controversial remarks about Mexican immigrants being criminals and rapists.